The 12th Day of Christmas - Brooks Pure Drift, Pure Project! It's finally here, my 12th Day of Christmas post. This is the most coveted day of my Christmas lineup. I could have selected a Garmin watch or another fancy running gadget. Instead, I decided to dedicate this to running shoes. I am a runner with a shoe problem. Put running shoes into that equation and we have a serious problem since they are not cheap and I would prefer them to match my outfits. I stalk certain websites to see early releases of new shoe models and colors. Being pink is my favorite color and I am a girly girl, I am really loving the new color schemes out there. I have been an Asics girl from day one. Up until recently, I never thought I would give another shoe a chance. This was until I was invited to test out the Brooks Pure Drift, an amazingly light shoe which is extremely comfortable and part of the Brooks Pure Project. Feel more with less! When the box arrived with my new shoes, it was like one of those nest egg presents that have a smaller and smaller box inside until you get to the present. Every flap had a new message. These are more than just a running shoe. 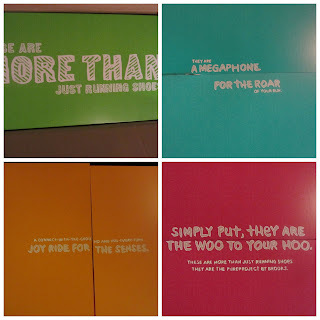 They are a megaphone for the roar of your run. A connect-with-the-ground and hug-every-turn joy ride for the senses. Simply put, the are the woo to your hoo. 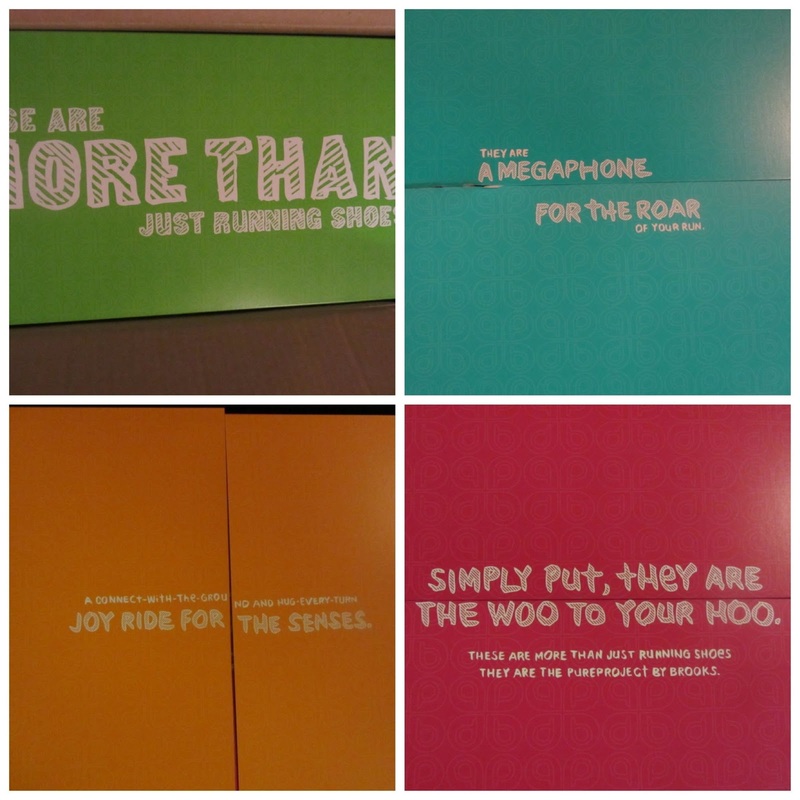 These are more than just running shoes, they are the pureproject by Brooks. I knew I was getting close to the prize when I saw the last note in pink. Check out how every flap had a decorative aspect to it once opened. Then I saw the Pure Project Pure Drift in all of their glory. Black with bright pink and grey accents. The brooks logo is light reflective for night runners like myself. I was also excited to learn that Brooks has a nightlife running collection! The bottom is actually mother of pearl. At first glance, I thought it was bright white which scared me because I didn't want them to get dirty fast. Then I saw the glimmer and decided I really like the contrast. The best part, these comfortable shoes weigh less than 6 ounces and have so much technology other shoes will be jealous of. Dual Toe Flex, Injected Midsole, Removable sockliner, a biogradable midsole; BioMoGo DNA, IDEAL Heel, Nav Band, Anatomical Last. Because of their lightweight construction and fewer materials, runners should generally expect shoes from the PureProject line to last approximately 250-300 miles. These shoes are not available to the public until January but you can pre-order them today and they will be shipped on 1/3/13. On a side note, if you are looking to buy your loved one a new pair of running shoes and are unsure of what kind of shoes they run in, please buy them a gift card. Every runner is different, therefor many people need different types of shoes. Thank you Brooks for allowing me the opportunity to check these shoes out for myself. I cannot wait to report back in the following weeks what my long term experience is with them. If you need anymore proof that these shoes are amazingly light, check out this video from Brooks Running! You can follow Brooks Running on facebook by clicking here and on twitter by clicking here. I was given a free pair of Brooks Pure Drift shoes for review. The opinions are completely my own based on my experience.